If you’re like me…you’re still scrambling with some last minute cards *grin*. If you are not…I applaud you!!! Here’s a quick one that you can crank out in a matter of minutes. 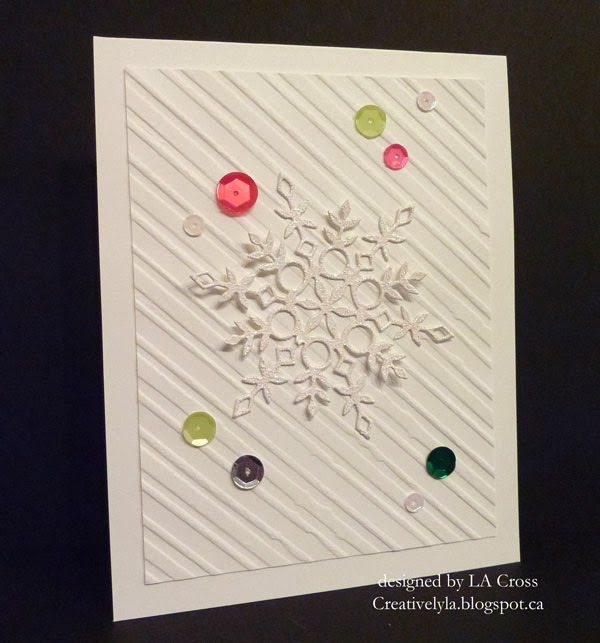 The background is embossed with the Tim Holtz Sizzix Candy Stripes embossing folder. I liked the texture on the back so used that. The snowflake is from Simon Says Stamp…it’s called Eliza. It’s been heat embossed with some WOW Sparkling Snow embossing glitter. Then just a sprinkle of Lawn Fawn Mixed Sequins and done! How’s that for easy peasy?